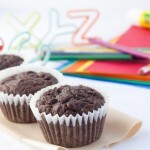 Chocolate muffins packed with healthful ingredients! 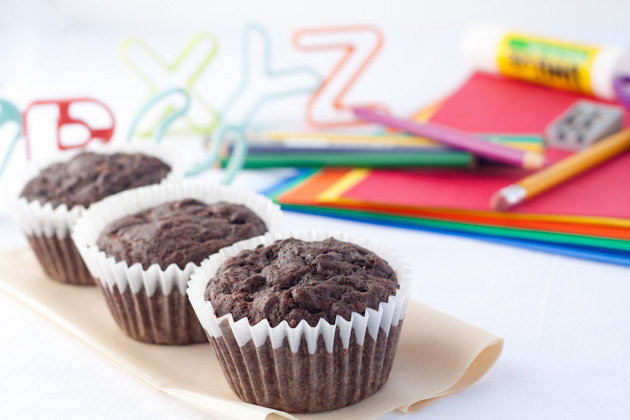 Combine cocoa powder, coconut flour, baking soda, and salt in a large bowl. Set aside. In a small bowl, mix eggs, honey, oil, apple butter, and vanilla until incorporated. Pour the wet mixture into the dry and mix with a wooden spoon or spatula until just mixed. Before you add the zucchini, be sure to squeeze out additional moisture. This can be done by placing the zucchini in your hand and squeezing it, or wrapping it in a kitchen towel and ringing the zucchini out. Then, add zucchini and chocolate chips to the mix and stir until each piece of batter has a chocolate chip in it! Place 10 medium muffin liners in a muffin pan and spoon the mixture into each tin so they’re about 2/3 to 3/4 of the way full. Bake on the middle rack for 23-25 minutes, or until a toothpick inserted in the center comes out clean. Remove from the oven and allow to cool completely (about 1 hour) before serving.